Peru have been left hugely frustrated at the 2018 World Cup thus far, but they finally had a reason to cheer thanks to Andre Carrillo against Australia. 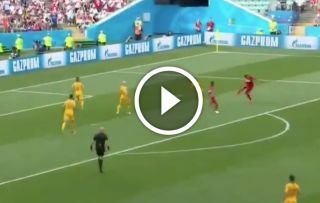 The 27-year-old produced a wonderful finish to hammer his effort into the back of the net, and as seen in his celebration, he was delighted to break Peru’s duck in Russia. Having been beaten by both Denmark and France in their opening two games, Peru had no chance of going through to the knockout stage of the World Cup, but pride was most certainly on the line as they would have been desperate to avoid going home with nothing to show for their efforts. A major criticism of their play in the tournament has been their wastefulness and lack of a clinical edge in the final third, but Carrillo finally produced an emphatic response to that. As noted in the tweet below, it was Peru’s first World Cup goal in 36 years, and so while they will be heading home imminently, they would undoubtedly have given the nation reason to be happy as they look to sign off with three points against the Socceroos. André Carrillo scores Peru’s first #WorldCup goal in 36 years.